Wasn’t it just a week or so ago that Wynn Resorts (WYNN) successfully complete the IPO of the Macau properties? If memory serves, they collected somewhere around $1.5 billion in order to fund expansion and operations. Now why would they be needing an additional $500 million so quickly? Well, of course it is because when fish are feeding, they will even bite on a baitless hook. So, investors are seen as fish and throwing anything into the investment pond is being gobbled up. Wynn knows this. 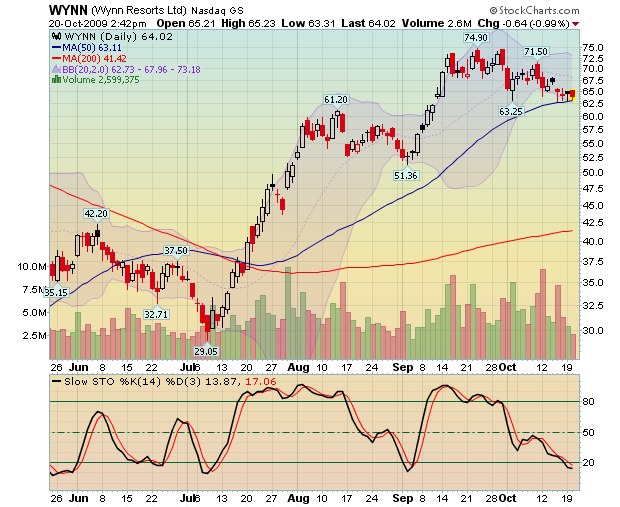 We initiated a short position on WYNN last week as the stock has moved past a reasonable valuation levels. We believe that investors expect that the Vegas properties will quickly return to favor. That is more hope than a reality. With housing prices still depressed and job losses rising, the fact is that Vegas is not Macau. Add to that the fact that Macau is looking into limiting tables and machines while increasing the minimum age from 18 to 21 to gamble. Let us also not forget that competitor Pansy Ho is looking to finish another floor on their flagship Macau property. Said another way: There are few catalysts to move the shares much higher. Technically, there is downside support at $57.25. If that is tested the next level is $52.50. Even as the shares have managed to hold on to the 50 day MA, once (if) they break below $63 it could be a quick move even lower. Upside stops are above the 20 day toward $68.50. Oct. 16 (Bloomberg) — MGM Mirage and Macau partner Pansy Ho plan to expand their casino and begin inspecting sites for potential resorts as they mull an initial public offering. The Macau venture is “under-represented” in the market and is “working on plans” to finish the 70,000 square feet of its casino‘s second floor, MGM Mirage Chief Executive Officer and Chairman Jim Murren said in a phone interview. MGM Grand Macau intends to look at sites in the Chinese city to build resorts, he said. MGM Mirage follows Las Vegas-based rivals Wynn Resorts Ltd. and Las Vegas Sands Corp. in seeking to raise funds from selling stakes in their operations in Macau, where gambling revenue is recovering. Murren‘s reiteration of plans to sell shares comes a day after a report that China tightened curbs on citizens‘ travel to Macau, the only Chinese region where casinos are legal. “In the short term, too many Macau plays may not be too good because of the unclear picture” surrounding travel policy, John Koh, who helps manage $1.1 billion at MEAG Hong Kong Ltd., said in a phone interview today. Beijing, worried about addiction, periodically tries to limit the flow of its tourists into Macau, on concerns that breakneck expansion there will foster social ills from corruption to prostitution. China quietly began easing curbs on citizens traveling from Guangdong province to Macau this year, top executives told Reuters in September. It had set rules last year limiting them to two trips a year, prompted partly by reports of officials gambling away millions of dollars in government funds. Oct. 20 (Bloomberg) — Wynn Resorts Ltd. said Wynn Las Vegas issued $500 million aggregate principal amount of 7.875 percent First Mortgage Notes due 2017. Proceeds will be used to repay credit and term-loan borrowings. The information was sent today in a regulatory filing.